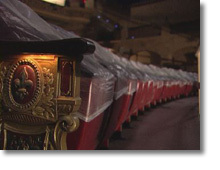 Jeffrey Mills was very busy covering the home stretch work of the Plaza Theatre's restoration. In these last three months, the stage house was completed and lighting grids, an orchestra lift, and the hardwood floors have gone in. In the main auditorium, the seats have been installed, carpeting laid down, and the faux greenery reinstalled along the atmospheric walls. The smaller Philanthropy Theatre in the building annex continues to be built out and the marque has been restored to its original form circa 1929 when the theatre originally opened.